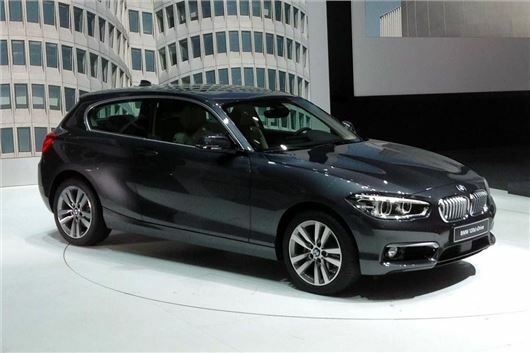 BMW has given the 1 Series a refresh, with updated styling and improved efficiency. New technology and new engines complete the overhaul. The new car made its first appearance at the 2015 Geneva Motor Show and will be available from 28 March, with prices from £20,245. Styling wise the 1 Series gets a more comprehensive makeover than has been typical of BMW lately, with slimmer headlights (optionally available as full-LED) at the front and new tail lights at the rear, plus there are restyled bumpers and a new grille. The engine remains remains wide, with 118i, 120i, 125i and 135i petrol options with power outputs of between 136PS and 326PS. The diesel range is made up of 116d, 118d, 120d 120d xDrive and 125d, with outputs of between 116PS and 224PS. The range kicks off with the 118i petrol, while the entry-level 116d diesel is a new 1.5-litre three-cylinder engine familiar from the latest MINI. This produces 116PS and 270Nm of torque, with an emissions figure of as low as 89g/km – equating to official economy of 83.1mpg. Standard equipment across all variants includes keyless ignition, air conditioning, automatic lights and wipers, DAB radio, 16-inch alloy wheels and iDrive. The 1 Series has a SIM card preinstalled to allow the car to connect to BMW for services like real-time traffic and an automated emergency call system. A key new technology on offer as an option is the new Professional Navigation system. When paired with an automatic transmission this analyses the road and tells the driver when to lift off the throttle ahead of corners and junctions, in order to maximise the effectiveness of coasting and reduce fuel consumption. Other options included an improved Harman Kardon audio system with 12 speakers, electrically adjustable heated front seats and two-zone climate control.